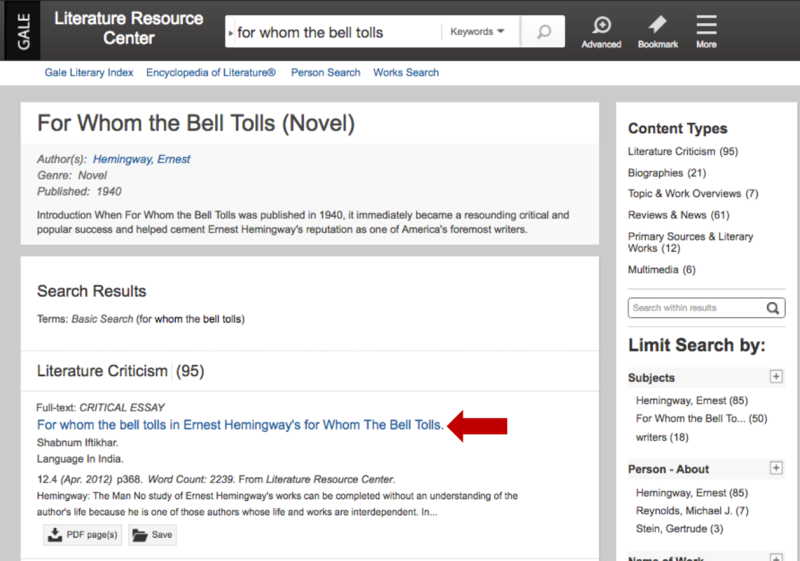 A persistent link is a link that takes the user directly to an article or other resource, allowing you to place links to specific resources in Schoology, syllabi, or other locations. 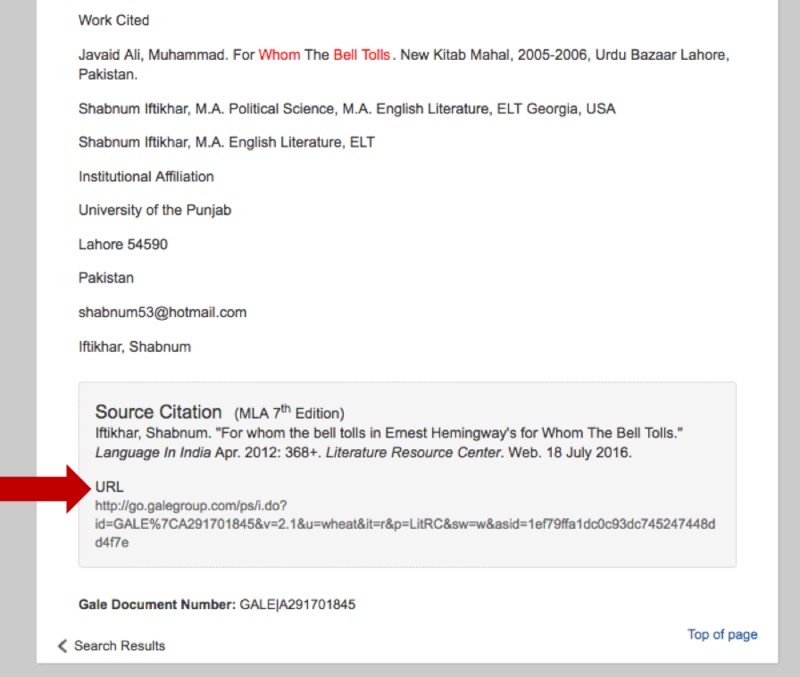 Without a persistent link, the student would be taken only to the search page of the library database and would have to do a search using the resource’s author, title, etc. in order to get the resource. 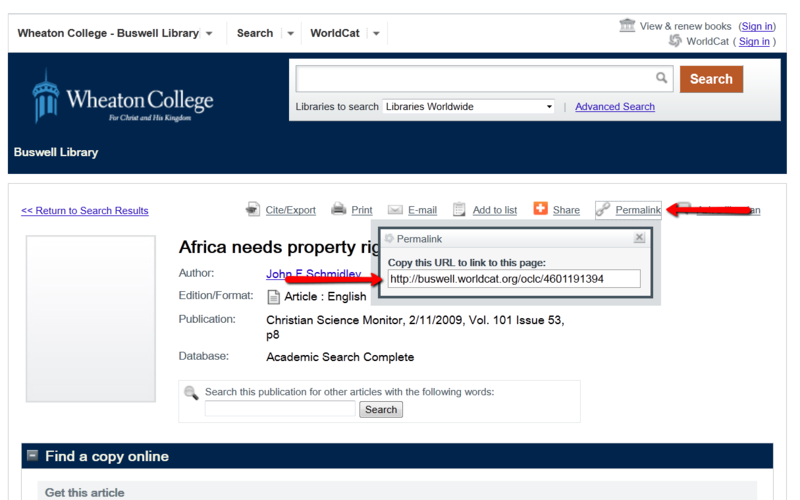 Find out whether the article is available in full text in one of the library's databases by using the Library's Citation Search. 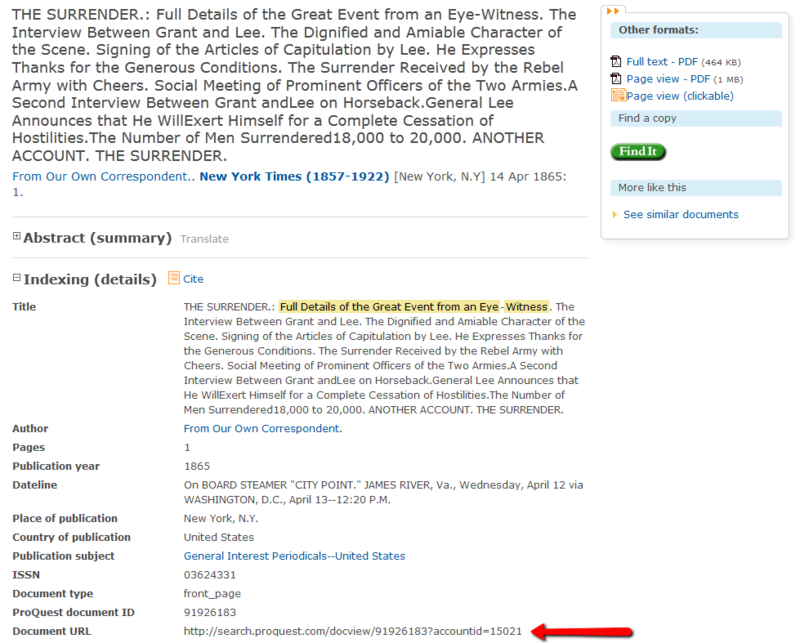 If the article is available, create the persistent link by following the steps outlined in the rest of this page. 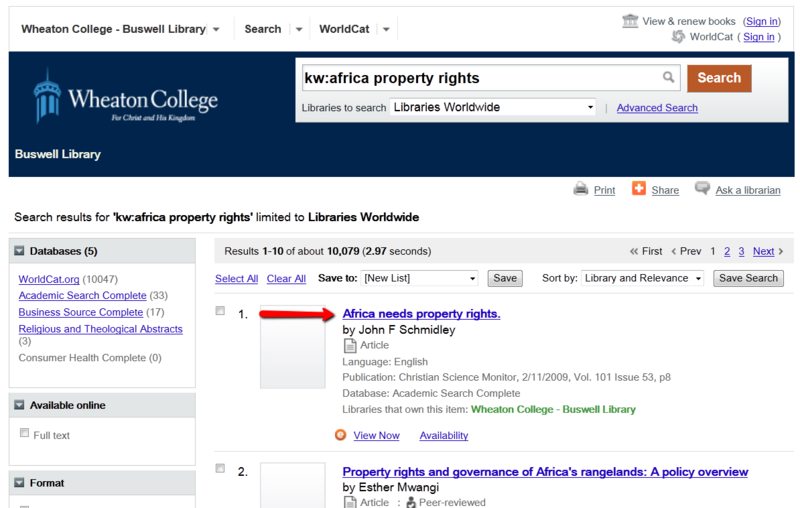 These steps show you how to create persistent links in some of the library-provided databases, including the library catalog, Atla and other EBSCOhost databases, JSTOR, ProQuest, and others. If the article you need is in a database not addressed by these instructions, please contact the library at research.help@wheaton.edu (ext. 5169). If you need help with putting the links in Schoology, please contact Julie.Giles@wheaton.edu in Academic & Institutional Technology (ext. 5334). While at a computer on campus, test the link in Schoology to ensure it works. If possible, test the link using a computer off-campus also. 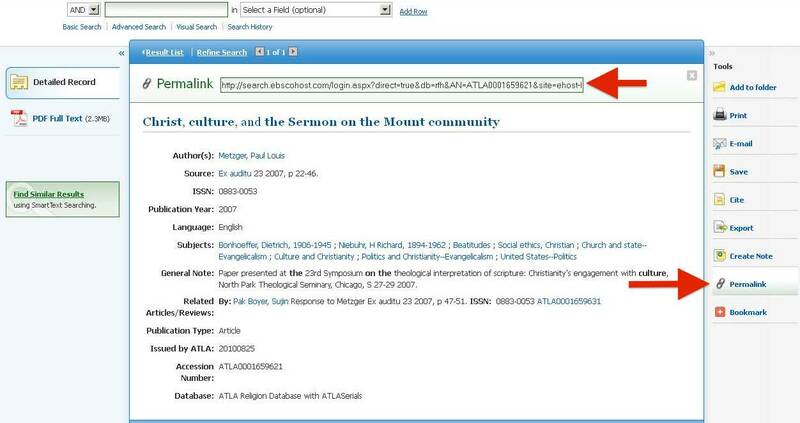 Beside each link you create in Schoology, state the full bibliographical information for the article. 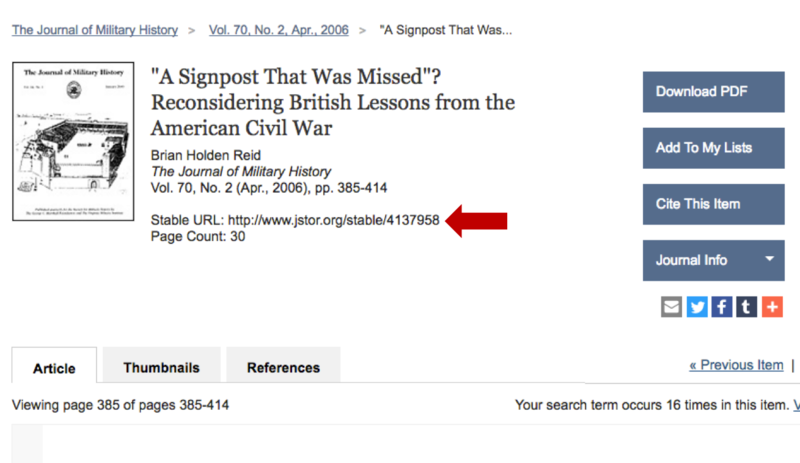 This way, your students will be able to track down the article even if the link fails for some reason during the course. 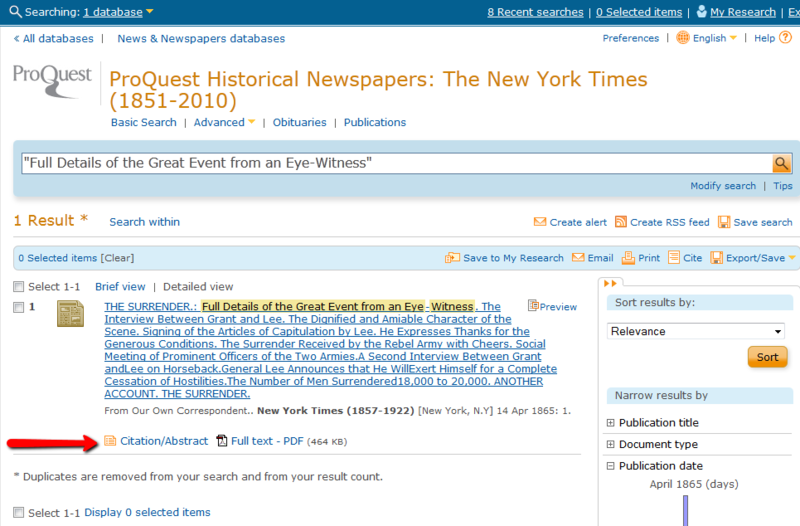 Click the title of the desired article in the search results list to view the article details. Click the "Permalink" link in the upper right of the item record, copy the URL that is provided, and paste it into Schoology (Materials ->Add Materials->Add File/Link/External Tool). The proxy prefix added onto the beginning of the article URL will send your off-campus students through an authentication process before viewing the article, allowing them to be recognized by the database vendor company as an authorized user. 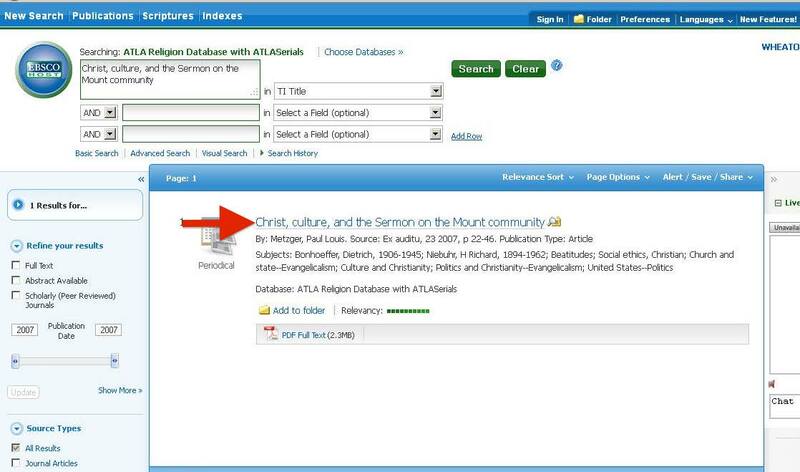 This includes 20 different databases, including Academic Search Complete, Atla, ERIC, etc. Copy the URL of the persistent link, and paste it into Schoology (Materials ->Add Materials->Add File/Link/External Tool). Click the title of the desired article to view the article details. Copy the stable URL provided in the item description and paste it into Schoology (Materials ->Add Materials->Add File/Link/External Tool). Click the title of the desired article to view the article information. Copy the URL at the bottom of the page and paste it into Schoology (Materials ->Add Materials->Add File/Link/External Tool). This includes databases such as New York Times Online, Dissertations & Theses, Chicago Defender, etc. Click on the Abstract of the desired article to display the article details. On the article display page, copy the "Document URL" found near the bottom of the first screen of the article display, and paste it into Schoology (Materials ->Add Materials->Add File/Link/External Tool).